artists’ tools | Ty Templeton's ART LAND!! 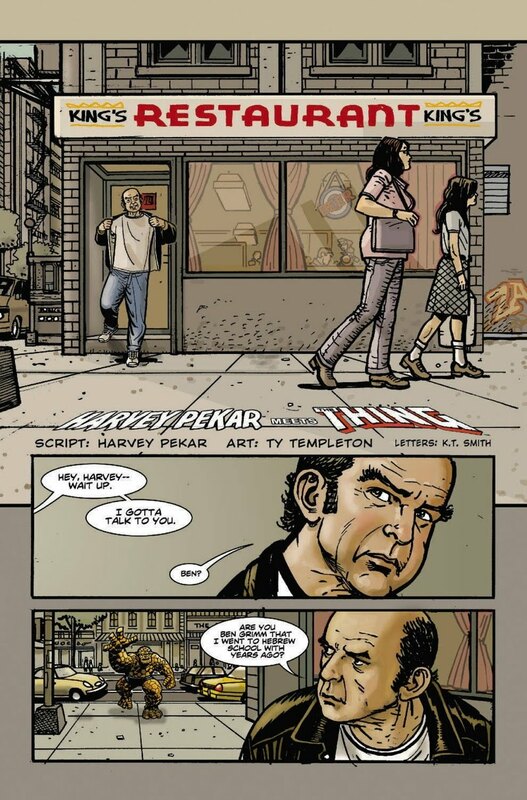 For various reasons, I’ve had to draw Ben Grimm (the recently published Harvey Pekar Meets the Thing, for instance—from Strange Tales Volume 2 #3…) Hope ya got one, it was a fun issue. Well, after the third or fourth time you draw Ben’s mug, you realize how badly you want a detailed map of the cracks on his face, and the proportions of his brow ridges, etc, as it’s hard to visualize, otherwise. 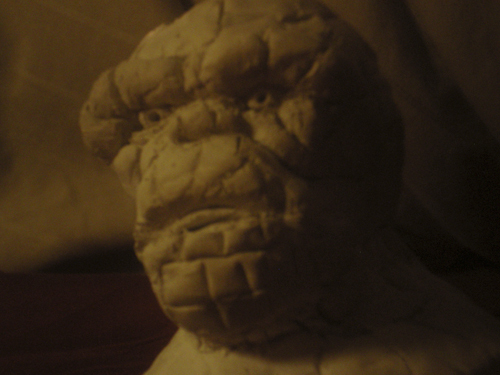 The normal solution is to roll up your sleeves and do a turnaround on the character, but I happened to have a bit of clay laying about from a different project I was mucking about with…so…. I tossed this together in about half an hour. It’s the size of a baseball, more or less, and after doing it, the Thing’s face makes complete sense to me if I have to draw it from a strange angle. Or give him dramatic lighting. The material it’s made out of is simple air dry clay, molded by hand, with a butter knife for the flatter parts, and a push pin (for the details). In the long run, it’s almost a form of me being lazy. It would have taken me about an hour to do a proper turnaround map for Ben’s head, and I wouldn’t have had a chance to get really mucky and sticky. I’ve done this a couple of times before. I made a Two-Face model like this when I was having trouble with a Batman cover. 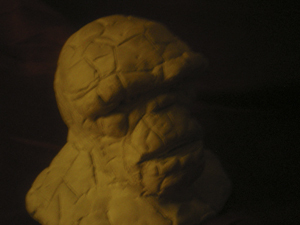 And I made clay models of the main characters in my graphic novel BIGG TIME when I was working on that. It’s a super-quick way to burn a character’s features into my brain to make them “real” with your bare hands. 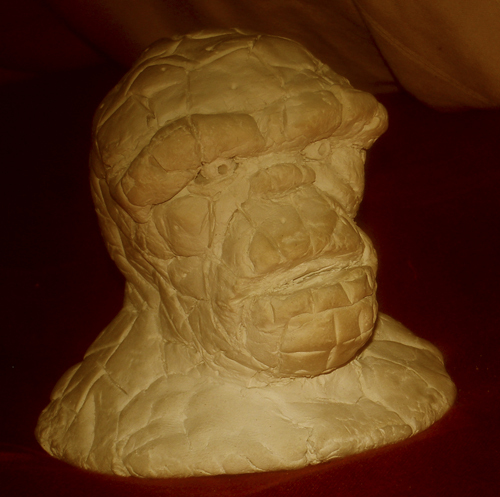 Usually, I find I don’t have to use the little head as a model after I’ve made it. 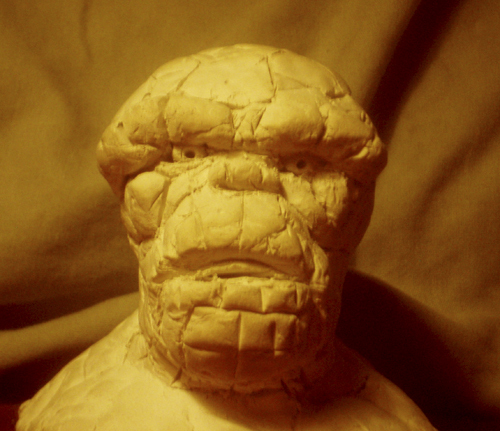 The act of sculpting it creates the model in my brain. Does that make sense?